Reducing the amount of oil used in cooking can help you enjoy fried foods that are more heathy and still flavorful. This is a guide about using less oil for frying. When frying hamburger meat, instead of using grease or oil, rub the skillet inside with the hamburger meat. This way you don't have to use oil or grease. I saw this on Chef Paul Prudhomme's TV show. 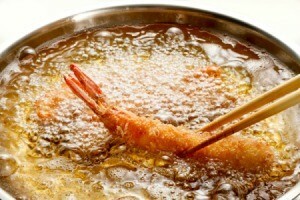 He said to stir the food in the oil, then drain the oil off, then place into a skillet. This was his suggestion. He wanted to fry up some cubed ham in a frying pan prior to making an omelette. So he poured oil over the mound of cubed ham and mentioned that it should have been in a larger bowl so it could be stirred for better coating. I'd imagine that you should also drain the ham into a colander prior to putting into a pan to get off the excess oil. He pointed out that the ham in the skillet wasn't sitting in a puddle of oil which would have burnt in the outer edges of the pan where the food wasn't located. Hey - I'll try it. Sounds logical.